I just cant stop! Every time the yearly retreat is announced I get goosebumps and my heart starts beating fast in anticipation of the adventure! Marfa is such a paradoxically special place to visit in any capacity, but going with my Omies is what makes it truly magical. Both relaxing and exciting, quiet yet full of life, a ghosttown with a vibrance unmatched, if you’ve been wondering what all the fuss is about, wonder no more! Im about to share the top 7 reasons the Marfa Retreat is the one retreat I will never say no to. The town itself is a living, breathing work of art. There is no direction you can look in and not feel as though you are in an art instillation. From the dining places, to the hotels and streets, to the majestic splendor of the West Texas landscape, Marfa is brilliant and beautiful. A haven for artists and creatives from the world over, you will be awed daily by the loving touches that make Marfa shine. It doesnt matter if you are a health nut, a die hard vegan, or love eating steaks and BBQ, from the catered meals to the restaurants to the food trucks and coffee stands, Marfa will tickle not just your taste buds, but all of your senses as they nourish you with style. It wouldn’t be a yoga retreat without daily yoga practices, and there is a reason I’ve been a ride or die omie since i started attending the chapel classes 4 years ago. The level of thought and love that go into the yoga flows take it far beyond the usual phyisical practice into the realms of the mystical. I love the intimacy and inspiration mindfully woven into each practice. I also love the hands on assists!!! Please touch me! I love a good workshop! 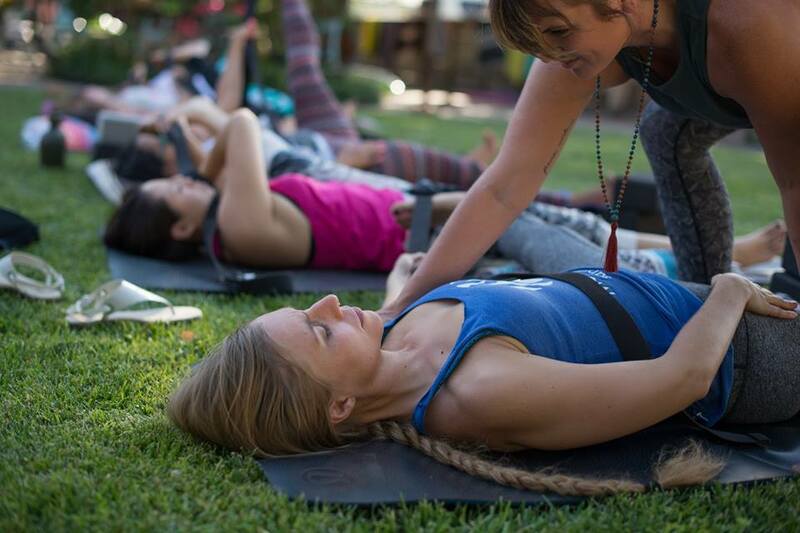 Exploring new ideas, crafts and styles of yoga makes me feel like a kid at summer camp(with wine) We have made dream catchers, chakra balancing essential oils, explored astrology, yin yoga and more. I love spending time both relaxing, enjoying the company and insight of my Sangha and learning something new! Starry Night over the El Cosmico Tee Pees in Marfa. There is nothing like the infinite starscape of West Texas to put everything into perspective. You have never seen the sky like this. Nuff said. As adults we so rarely get the opportunity to spend intimate quality time on this scale with like minded individuals. 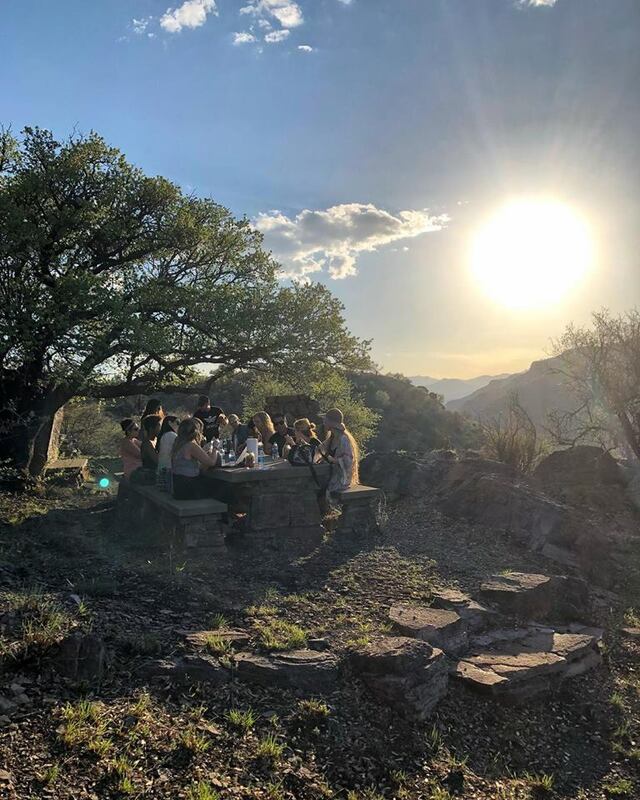 It is so refreshing to enjoy the company of everyone i have met on these retreats, The bonds made here are still strong, and often times we meet on the next Marfa trip, to relive the magic all over again. 7. Picnics in the mountains, Say What!!! How majestic is this!! Picnicking on the side of a mountain while enjoying sparkling company, artfully prepared food and breathtaking views. This is one of those moments that live forever! To be perfectly honest, I could continue on for hours about the reasons I love our yearly Marfa trip, but they are as infinite as the west Texas sky. The time and care put into curating this retreat paired with the depth and scope of the city itself multiplied by the beautiful people you come to know and love simply equal that this trip will change your life. It changed mine. It gives focus and perspective to my entire year each time I revisit. Marfa is my New Years Day. I hope you’ll join us this year to see for yourself. Every trip is different than the last, and every trip makes me love Marfa and Mobile Om even more. Come with us! I’d love to get to know you!